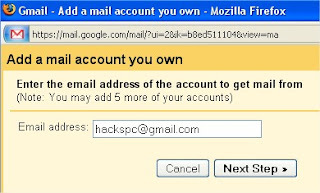 Here is the useful Gmail hack for you. Most of us own more than one gmail account , one of the most annoying aspects of dealing with it is the fact that you cannot have more than one opened at the same time. Luckily, Firefox has a plugin, called Gmail manager , it is an add-on for firefox that allows you to manage multiple Gmail accounts. Just download plugin from this site and install. -Enter the email address of the account to get mail from and click on the Next Step button. After this you’ll be able to retrieve mail from this account. Select desired label, search or message and click Add Quick Link in the Quick Links box.